Theme Park #BuiltForKids to Deliver Calendar Full of Kid-Friendly Fun – and It’s All Included with Admission! 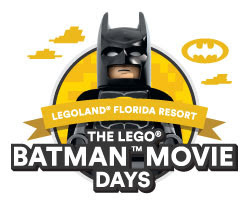 WINTER HAVEN, Fla. (Dec. 27, 2016) – Gotham City’s Caped Crusader kicks off an awesome lineup of special events at LEGOLAND®Florida Resort in 2017, promising plenty of fun, fireworks and festivities at the popular vacation destination, including two all-new events. Whether it’s fan-focused celebrations of blockbuster properties like “The LEGO® Batman™ Movie” and LEGO Star Wars™, an exclusive KIDZ BOP concert series or a unique spin on special occasions like Halloween, Christmas and New Year’s Eve, LEGOLAND Florida Resort offers an incredible calendar of kid-centric events that bring to life the limitless creativity of the LEGO brand. The LEGO Batman™ Movie Days – March 4-5 & 11-12; new this year! Super hero. Crime-fighter. Master Builder. LEGO Batman™ is all of those and so much more. Come meet Gotham City’s Caped Crusader during this celebration of the Warner Bros. feature film, which will include photo ops with the scene-stealing star, a themed scavenger hunt and LEGO Batman™-inspired LEGO build activities. KIDZ BOP Weekend – April 28-30; new this year! LEGO Star Wars™ Days – May 6-7 & 13-14; two weekends this year! Visit a galaxy far, far away during this Lucasfilm-authorized event, which features some of the most famous scenes from the Star Wars™ saga made out of 1.5 million LEGO bricks in our LEGO Star Wars™ MINILAND Model Display. Activities will include appearances by costumed Star Wars™ fans, LEGO building activities inspired by Star Wars™ characters, settings and stories, and a Star Wars™-themed costume parade for kids. It’s the only LEGO Star Wars™ theme park event in Florida! When the sun goes down, the fun goes up during our signature summertime event, exclusive to LEGOLAND Florida Resort! The Good Knight offers extended park hours, uniquely LEGO light displays, opportunities to build alongside our Master Model Builders and meet-and-greet opportunities with one of the heroes of LEGO NEXO KNIGHTS™! Plus, enjoy a spectacular themed fireworks show over Lake Eloise to end the night, with a special patriotic show planned for the Fourth of July. The National Fire Protection Association returns for our annual kickoff of NFPA’s Fire Prevention Week and a month-long celebration of real-life heroes. The event includes fun, educational activities that teach kids the importance of fire safety, plus opportunities to meet firefighters who keep our community safe. Our annual, all-day Halloween event promises lots of spooky, kooky fun throughout the theme park, including larger-than-life LEGO models, a costume parade, multiple LEGO build activities, trick-or-treating (with lots of candy! ), exclusive LEGO character meet-and-greets, a Halloween-themed fireworks show, and much more! Join us for lots of festive fun throughout the theme park as we celebrate the season with a giant Christmas tree made of thousands of LEGO and DUPLO® bricks, holiday-themed scavenger hunts and LEGO building activities, meet-and-greets with LEGO Santa and LEGO Toy Soldier, sparkling lights, beautiful decorations and even the occasional snow flurry! Plus, each date ends with a not-so-silent-night fireworks spectacular choreographed to classic holiday music. Ring in the New Year with our one-night-only party built for kids, featuring an exclusive dance party, park-wide LEGO building activities and special entertainment, and an awesome fireworks show that kicks off with the countdown to our giant LEGO “brick drop” – all before midnight! The best way to enjoy this incredible lineup of events is with our Awesome Annual Pass, which offers unlimited admission for a whole year to both LEGOLAND Florida theme park and LEGOLAND Water Park, along with many other great benefits. It’s a terrific value at just $99 plus tax for Florida residents. Meanwhile, more than 50 rides, shows and attractions inspired by the LEGO and DUPLO brands can be found at the place where #AwesomeAwaits, including experiences based on “The LEGO Movie™,” LEGO NINJAGO, LEGO NEXO KNIGHTS, LEGO City, LEGO Technic and LEGO Friends.